The Revised Common Lectionary has given us a pair of texts this Sunday (Mark 6:30-34, 53-56). They are shoved together so they appear to be one story, but actually they are separated by a whole eventful day. 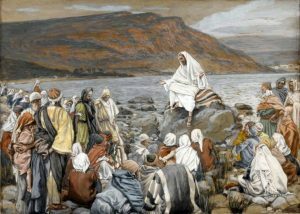 Story 1: The disciples return from their mission trip and Jesus takes them away for a rest, only to be found out by an enormous crowd in need of teaching. That afternoon he gave a miraculous meal to the crowd of 5000. In the evening he sent the disciples ahead by boat while he stayed alone to pray. Early in the morning he decided to walk across, apparently planning to surprise them by being at their destination first. There was a storm and he stopped to help — totally freaking them out, I might add. Story 2: The next day when they came to land at Gennesaret, word spread like wildfire, and people came in droves bringing all their sick friends for healing. There are a number of things going on in this text that are worthy of meditation, and all are themes echoed in other passages in Mark’s Gospel. Jesus doesn’t only speak good news. He offers real life, real healing, real restoration, giving it all away wherever he goes. The result is he is enormously popular. People totally want this stuff. Wherever he goes, his reputation precedes him. When he takes the returning missionaries off for a rest, a crowd has already gathered. When they sail off to Gennesaret, word spreads like wildfire. People come to Jesus from everywhere. They bring their friends. And this is humbling for all of us who are parts of churches which people aren’t rushing to — and churches whose members think twice before inviting a friend to come and visit. By the painful logic of Mark’s Gospel, if we were doing ministry his way people would be beating down our doors. In this section of Mark I’ve long been impressed by Jesus’ quietly relentless focus on his own priorities. He knows what his mission is, and he knows what kinds of things embody it or make it possible. At a glance, Jesus is sort of buffeted about by external pressures, especially by those crowds that keep showing up. But look at what he does. When the disciples return from their mission, he sees and tends to their need for rest. When that agenda is interrupted by an unexpected crowd, Jesus turns his attention to their need — they are a bunch of lost sheep, and need his teaching. In the omitted bits there is more, as he tends to their physical hunger. All of this looks like interruption and distraction. But Jesus is always conscious of his purposes: to build up, to teach, to heal, to feed. I know I get deeply frustrated by days when my sense of priorities gets thwarted by surprising demands. Maybe it bugged Jesus too. If so, Mark didn’t report it. What I see is Jesus redirecting his energy where it was needed to fulfill a different part of his mission. The management consultants surely don’t like this, since he seems to let the urgent prevail over the important. But is he? It is actually all right in line with his mission — just in different ways than he first aimed for. Then there is the Sea of Galilee. Scene by scene, they sail across and face the next scene of action on land, whether it is healing or teaching or whatever. In between outward activities, Jesus and his friends spend time sailing in the deep. It is very metaphorical. It gets amplified or clarified in one of the omitted bits, where Jesus himself goes off to pray while his friends sail across. That’s the real deep. We need to find restoration, to grow in our communion with Christ in a life of active ministry. To do that we need to spend time sailing in the deep, or going alone up the mountain. Life needs a rhythm of work and rest, of active service and contemplation — hey, kind of like that seven day cycle thing with the Sabbath and all. Last I would note in passing the seemingly odd thing that happened at Gennesaret. The sick people didn’t need or ask for a conversation with Jesus. They just needed to be positioned to reach out and touch his garment as he passed, and they were healed. This happened before: Remember the woman who had a bleeding disorder for 12 years before sneaking up in a crowd to touch Jesus’ clothes? This will happen again: Think about the stories in Acts where people were healed by Peter’s shadow falling across them (Acts 5:15-16), or by touching a handkerchief that had touched Paul’s body (Acts 19:12). I ask you: Is it any wonder that in the early centuries the bones of the martyrs were treasured as relics? Protestants tend to think it odd or superstitious when Catholic or Orthodox Christians value relics of saints, including bits of their clothing. They would have good reason to tell us they are just being biblical. As I read it, a few things popped into my head. I don’t think we can credit Jesus for doing ministry incorrectly. After all, he was the Son of God. Yet, his ministry got him killed! In addition, his disciples still ran away, betrayed him, and denied knowing him. Only one–of the “official” twelve, John–stayed with him at the cross. And, there’s that story about the disciples finding unauthorized folks healing and preaching. Perhaps, it’s like an “unorthodox” denomination popping up. As the story is written, the disciples have just tried that very same thing and failed. It’s a huge embarrassment. The “authorized” guys are failing, and the “unauthorized” folks are succeeding! Jesus tells them not to worry about it, but that’s hard! With all that in mind, is there a secret to “correct” ministry so that folks come to beat down our doors and demand more services? Of course the statement in my post has to be qualified. Otherwise we would fall into the trap of the marketing plan ministry, where everything is built on the principle of offering the “target market” something that pleases, entertains, and so forth. And yes, despite Jesus’ enormous success with the crowd, his ministry led to his death. But when I read Mark, I can’t help the impression that the LIFE he brought (healing every sickness, casting out the evil that plagued individuals, feeding people by the thousands, etc.) made him desirable. People wanted what he offered, and they came running from outlying towns to be near him, sat in the sun through dinner time to hear him, squeezed through crowds to touch him… The impression in Mark is of a savior under constant and massive pressure from those who needed him and those he served with such mercy. And then I think of some churches whose lives are consumed by turning inward to keep it together, find enough funds to pay the heating bill, etc., and so those outside don’t SEE the life Jesus offers being given out, and so they don’t stop by. I kind of thought you’d like the bit about the relics!